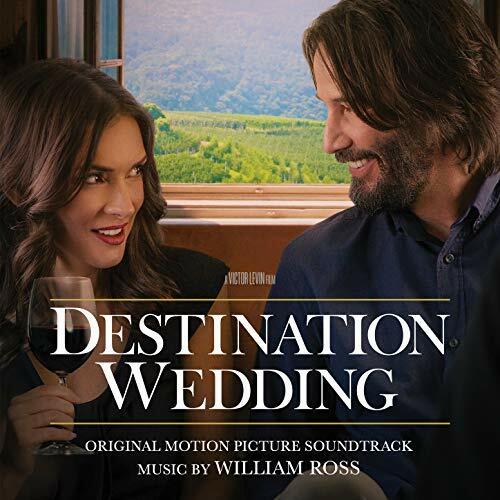 Lakeshore Records will release the official soundtrack album for the romantic comedy Destination Wedding. The album features the film’s original music composed by William Ross (Harry Potter and the Chamber of Secrets, My Dog Skip, Ladder 49, Tin Cup, The Tale of Despereaux). The soundtrack will be released digitally next Friday, August 24 and is now available for pre-order on Amazon. Destination Wedding is written and directed by Victor Levin and stars Winona Ryder and Keanu Reeves. DESTINATION WEDDING reunites two of Hollywood’s most adored stars, Keanu Reeves and Winona Ryder. As the socially awkward Frank (Keanu) and Lindsay (Winona), the pair meets on their way to a mutual friends’ destination wedding in California wine country. They soon discover they have a lot in common: both hate the bride, the groom, the wedding, themselves, and most especially each other. While their snarkiness isolates Frank and Lindsay from the other guest, the weekend’s events conspire to repeatedly force the unlikely pair together. Frank and Lindsay find that if you verbally spar with someone long enough, anything can happen. When debate gives way to desire, they must decide which is stronger: their hearts or their common sense. Mr. Ross has arranged music for a remarkable list of artists including Barbra Streisand, Celine Dion, Josh Groban, Andrea Bocelli, Michael Buble, Stevie Wonder, Mary J. Blige, Kenny G., Sting, Seal, Quincy Jones, Rod Stewart, Bette Midler, Barry Manilow, David Foster, Mariah Carey, and Whitney Houston, to mention just a few. The records on which he has worked have sold over 250 million copies combined in the United States. He has served as Music Director and Conductor for many artists and occasions, including Barbra Streisand’s historic 2006, 2007 and 2012 concert tours, and the 79th Academy Awards ceremony in 2007, for which he received his second Emmy Award. He reprised this role three times, for the 83rd, 85th, and 86th Academy Awards. His arrangements have been featured in many films and include such hits as Andrea Bocelli’s “God Bless Us Everyone” from Disney’s A CHRISTMAS CAROL, Celine Dion’s Grammy-winning “My Heart Will Go On,” from the motion picture TITANIC; “Believe,” sung by Josh Groban in the film THE POLAR EXPRESS; “The Prayer” with Andrea Bocelli and Celine Dion from QUEST FOR CAMELOT, for which he received a Grammy nomination; and the Academy Award Nominated song “Run To You” sung by Whitney Houston in THE BODYGUARD. Arrangements by Mr. Ross have been a part of the opening ceremonies of several Super Bowls along with the opening and/or closing ceremonies of the Olympic Games in Calgary (1988), Atlanta (1996), Salt Lake City (2002), Torino (2006), Vancouver (2010) and Sochi (2014). He was awarded an Emmy Award in 2009 for Outstanding Original Music for his work on the song “Hugh Jackman Opening Number,” featured during the 81st Academy Awards ceremony. Mr. Ross is the recipient of four Emmy Awards, two BMI Film Music Awards and was nominated for an Annie Award and two Grammy Awards.